Birding Corvo 2009: B-b Pipit and new Ring-billed Gull! Clear sky in the morning so I did the Caldeira today. Buff-bellied Pipit and all the ducks were still there. 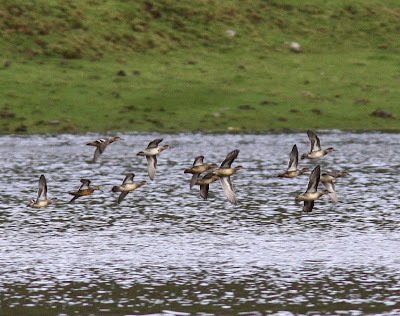 New birds were a flock of Teals which I spent a few hours studying in search for my 130th Azores tick. Couldn't see anyone looking like a Green-winged though, they were all Common ones. 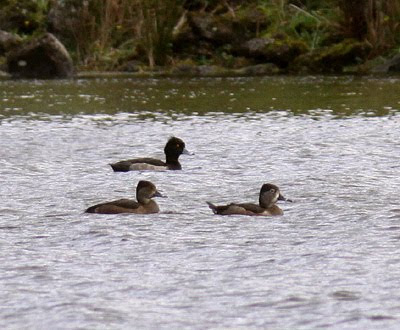 The Tufted Duck (Aythya fuligula) and Ring-necked Ducks (Aythya collaris) are still going strong. After six hours in the Caldeira I went back to the village and ended the day with a two hour seawatch. Strong wind, big waves and few birds. 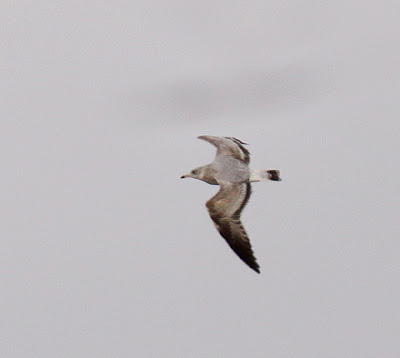 A nice surprise was this young Ring-billed Gull flying by, a new individual! The last days constant westerlies are a result of low pressures in the NW and a high pressure in the SW creating a corridor of winds straight to Corvo. I wonder if such a high pressure has the potential of wipping stuff up and out from further south in the States... maybe thats what brought the Myrtle Warbler (if it hadn't already been there for some time)? Fortsatt bra slit låter det som, gött :) Tack för infon om trollsländorna, det stillade min nyfikenhet en smula..